Yes, you are reading this headline correctly. 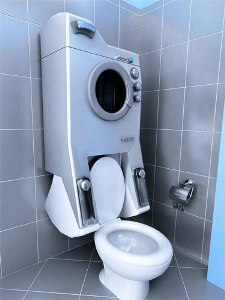 Someone actually invented a washing machine that works in conjunction with a toilet. Yeah, I know it sounds pretty gross, but listen to what the WashUP actually does. The washing machine is stationed above the toilet in order to recycle the washer water into the toilet. The concept is based on a simple premise: why use fresh water to go to the bathroom in? The WashUP puts in soapy water from the washing machine that would have otherwise have gone down the drain and puts it to good use. Now you can go in part-clean, part dirty water and send it, well, down the drain. The washer is also built high so you don’t need to crouch down to put your clothes in. Now that’s something that is an improvement. The only thing that doesn’t seem to be well thought out on this WashUP is where do you dry your clothes? I mean, if the washer is now in the bathroom above the toilet, where is the dryer going to go, in the shower? I would think that would be an obvious flow in the logic, but I guess the concept designer didn’t see it that way. I also wonder if planet Earth is at the point where we need to recycle our water that much. What if your cloths fall in the toilet? yes – the planet is at the point where we need to re-use our greywater. And the dryer? It’s outside in the fresh air!